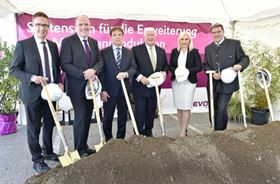 Evonik Industries' groundbreaking ceremony for the expansion of its membrane production site in Schörfling, Austria. Evonik is building another operations complex in Schörfling for the production of its SEPURAN gas separation membrane modules. In addition to a new hollow fiber spinning plant, the facility will include space for research and development, application technology, and another warehouse. The new plant, which will double the existing production capacity, is scheduled to open in late 2017, creating more than 30 new jobs in Schörfling. “As one of our growth fields, the membrane business is an outstanding example of the way we access new markets with innovative products,” said Klaus Engel, chairman of the Evonik executive board. Evonik’s Schörfling plant currently produces gas separation modules primarily for the biogas market and for hydrogen and helium recovery. The new hollow fiber spinning plant will focus on the manufacture of membrane modules for efficient on-site nitrogen generation. “We want to supply the gas separation market with tailor-made products that make a significant contribution to greater efficiency for our customers. The investment in Schörfling creates additional opportunities to further broaden our membrane portfolio,” said Dr Claus Rettig, chairman of the board of management of Evonik Resource Efficiency GmbH. The company’s plant in Lenzing near the Schörfling site manufactures the source material polyimide, a high-performance polymer, which is spun and then further processed in Schörfling. The infrastructure in Lenzing will also be upgraded as part of the site expansion. Evonik Industries has opened another membrane production facility at its plant in Schörfling, Austria.